An omnivore is an animal whose species gets its energy and nutrients from a diet made up foods that include plants, animals, algae, fungi and bacteria. Many omnivores change their eating habits during their life cycle. They are sometimes called "life-history omnivores", because they are only omnivores if their whole life is considered. Some species, such as grazing waterfowl like geese, are known to eat mainly animals at one stage of their lives, but plants at another. Also, many insects, such as the beatle family Meloidae, eat animal tissue when they are larvae, but eat plant matter after they mature. 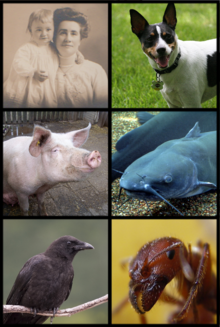 All of these animals are omnivores, but have different feeding behaviors and favorite foods. Being omnivores gives these animals more food security in stressful times. It also makes it easier for them to live in less consistent environments; (those that change along with the season, for example). Humans and apes are omnivores: they eat fruits, vegetables, and some meat, such as insects. ↑ Dewey T. & Bhagat S. (2002). "Canis lupus familiaris". Animal Diversity Web. Retrieved 10 July 2016. ↑ "Omnivore". National Geographic Education. National Geographic Society. Retrieved 10 July 2016. ↑ "Omnivore". www.eoearth.org. Retrieved 2016-04-03. ↑ Maclean, Gordon Lindsay (1993). Roberts' Birds of Southern Africa. Publisher: New Holland. ISBN 978-0620175838. ↑ Skaife S.H. 1953. African insect life. Longmans, Green, London. ↑ "For most of human history, being an omnivore was no dilemma". NPR.org. Retrieved 2016-04-03. This page was last changed on 12 February 2019, at 15:57.